I made my last trip over to the old allotment today. Its sad that I've got to leave (as now its too far away) as I really enjoyed the social side of it, but that did have it's downsides sometimes, you'd go down there with a list of jobs and get none of them done due to talking! The soil was terrible down there (heavy clay) and it would make doing any job a nightmare. The last visit wasn't for sentimental reasons though, it was to remove as many plants as I possibly could for my new veg garden. I went thinking there wasn't that many to take, but the list got longer and longer. In the end I removed globe artichokes, fennel, sea kale, angelica, a rose, comfrey, sage, sweet cicely, rhubarb, strawberries, mint, asparagus, some compost from the raised beds and some leeks for tea. 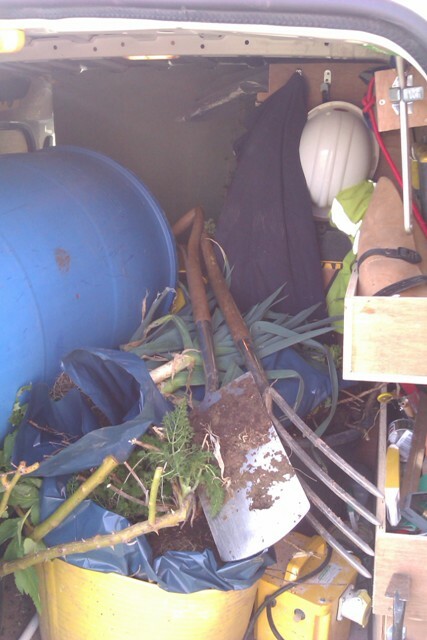 The van was packed and the allotment plot looked quite bare as I drove away. 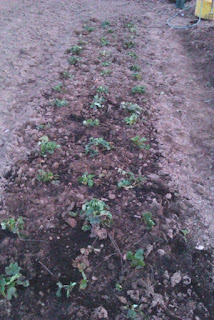 The one really surprising plant was the strawberries as I put in about 15 plants last year then didn't do anything with them, we didn't have a single strawberry off them but they ran rampant. Really rampant it turns out as when I dug them up there was over 75 plants rooted in a 4x4 raised bed. This evening I managed to plant everything in (although the fence still isn't finished so open to rabbits) but I had to limit myself to 50 strawberry plants - I have a feeling I may have gone over the top as it is!